Among the many problems in Windows 8 is the poor driver support offered by Hewlett Packard. The drivers are hard to find, do not install correctly if at all, and lack many features compared to older drivers. HP dropped manual duplex printing support for Windows 8, which means it’s now up to each application to add this functionality. 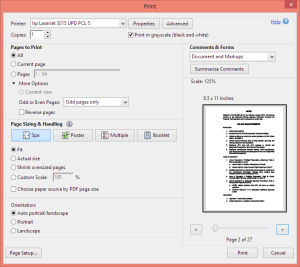 In Adobe Acrobat, this can be done with some care and attention to detail. When duplex printing manually, some types of laser printers give different results depending which side you print first. If you print the “front” side first and then the “back” side, you might end up with curled paper. To avoid or prevent this, you will have to flip the blank paper over and print the “back” side first. Due to the way paper is manufactured, it always has a grain direction, a concave side, and a convex side. Usually the grain is in the direction of the longest edge, and the concave side of the ream of paper faces the package seam. This can be determined by standing the paper on its short edge and watching which way it tends to curve, or by simply experimenting with which side gives the best results. If you normally print on the concave side of the paper, then that is what I mean by the “front” side. Printers are normally designed to use the concave side as this prevents the document from going limp in your hand when you hold it from the edge. The reason for reversing pages is that you want to be able to take the whole stack of pages from the output tray and flip it over. The last back side page needs to get printed first so that after flipping the stack, you can then print the first front side first. 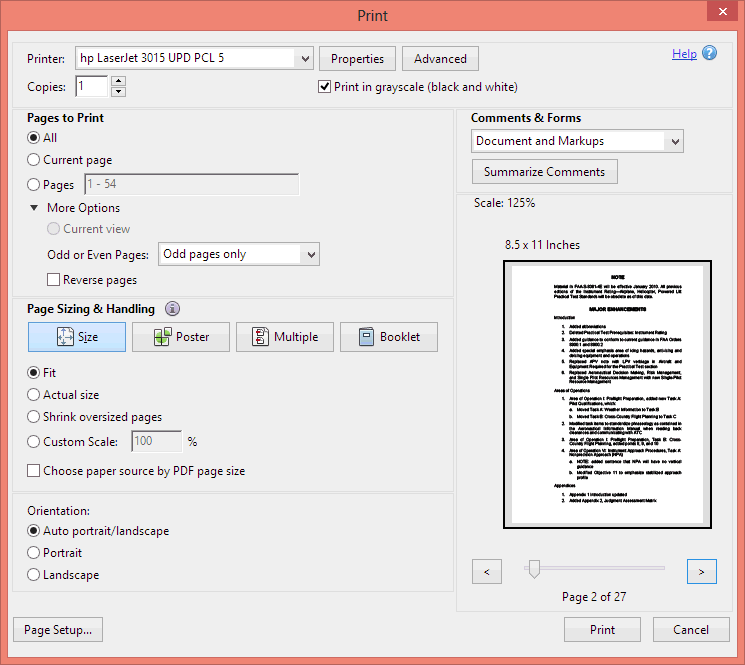 If you forget to select this option, you will have to manually collate all of the pages before Step 3, which is a huge waste of time. Don’t use the Multiple page option. Sorry but Acrobat’s Multiple page option is broken. You will end up with multiple even numbered pages and none of the odd numbered pages on the back sides if you select Multiple. Don’t use the Booklet page option for regular duplex printing. Booklets have folded pages, which are sorted in the wrong order for flat binding. 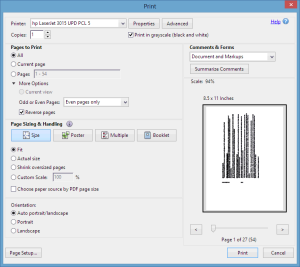 To get the correct page layout, you must rotate the stack from the output tray 180 degrees. In other words, the top edge of the stack must go through as the top edge again. The only time you would skip this step is if you want to bind the pages along the short edge instead of the long edge. Any blank paper remaining in the input tray should be flipped right-side-up now. If the output stack faces printed side up then you normally have to flip the stack as well. If the output stack faces printed side down, then the output is already flipped so don’t flip it again. 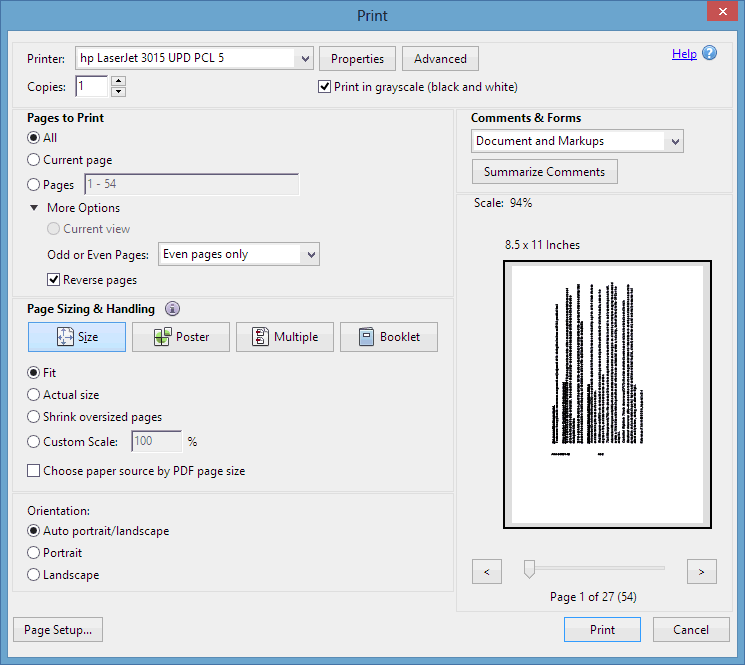 Put the output stack on top of any blank paper remaining in the input tray. Disable the “Reverse pages” setting.